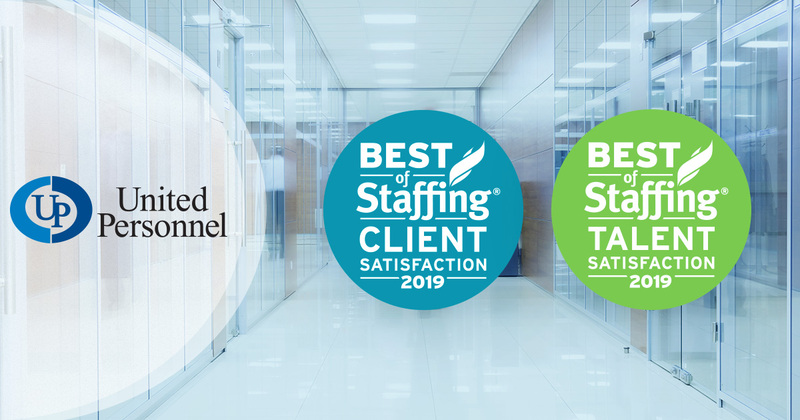 After a rigorous process that collected the opinions of various stakeholders, United Personnel has once again received ClearyRated’s Best of Staffing Client and Talent Awards. Each year, ClearlyRated, formerly Inavero, recognizes the top staffing agencies in the United States and Canada with their Best of Staffing Award. Reserved for less than 2 percent of all staffing agencies, the award follows an intense process that recognizes stellar ratings from both employers and job candidates. We are proud to receive this prestigious award, which recognizes our commitment to service quality throughout Massachusetts and Connecticut. Here at United Personnel, we’re in the connections business. Every day, we bring together more than 700 job candidates with exciting companies throughout Western Massachusetts and beyond. We strive to maximize the experience for both groups of stakeholders: the wonderful people looking for dynamic opportunities to advance their careers, and the exciting companies seeking energetic, creative people to drive growth at their businesses. For over 30 years, we have developed a profound knowledge of the local employment market. By cultivating close partnerships with many of the area’s largest employers - as well as smaller, local businesses - we can provide excellent matches for employers and candidates alike. The Best of Staffing® Award comes via ClearlyRated, a leading provider of satisfaction surveys for accounting and staffing firms. They use a three-step process to determine the top staffing firms in the industry. Step One – They contact both clients and job candidates with an electronic satisfaction survey. They are asked to grade their most recent experience using a 10-point scale, and rate the likelihood that they would recommend us to someone else, like a friend or colleague. Step Two - The survey results are collected, and the responses for each staffing agency are tallied and validated by both ClearlyRated, the administrator of the competition, and a third-party research firm. Step Three - They compute the satisfaction score that will act as a minimum for awarding the Best of Staffing designation. It’s worth noting that each year the minimum score for client and talent satisfaction has been significantly higher than the industry average. Through the years, it has been our pleasure to work with an impressive set of first-rate companies and candidates. Thank you for all your support and for giving us the opportunity to receive this honor. Our number-one priority has always been our clients and our candidates. We are honored to receive the Best of Staffing® Awards, but our main source of pride comes from the positive impact we’ve had on the lives of our clients and the talent we place. Nothing makes us happier than the fact that we have earned the trust and loyalty of so many great partners. "Great HR business partner! When the labor market is very low, United Personnel can be counted on to provide qualified candidates especially when temporary needs are necessary to meet operational demands." "LOVE working with Trish R. and her team! Always friendly, happy and provides great service!" "Everyone at UP has been professional, helpful and friendly. My placement was quick and perfect!" Thanks again for the opportunity to serve you. We look forward to helping you grow in 2019 and beyond.